Swedish metallers ENTOMBED A.D. will spend the next few months writing and recording their third album for a tentative early 2018 release. Speaking about the band's plans for the near future, vocalist Lars-Göran "LG" Petrov told Finland's Rauta at last month's Dark Days Of Helsinki festival (see video below): "First we're gonna be here, get a show, then have some beers with others, and then go home and write a new album." As for a possible release date for the disc, Petrov said: "Next year, early, if the plans go as it should be. And then the cycle goes around again. You make the album, you release the album, then tour." 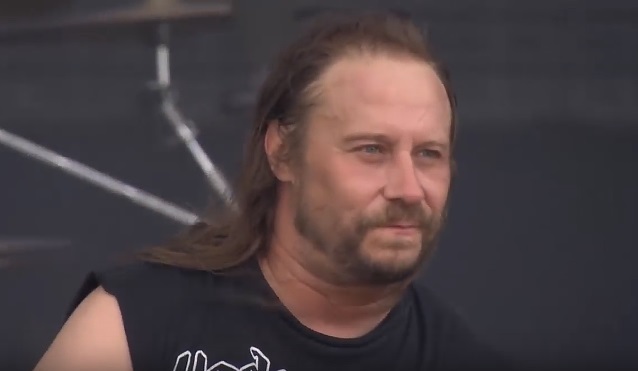 Petrov also talked about ENTOMBED's decision to release change its name to ENTOMBED A.D. in order to avoid a legal battle with ENTOMBED guitarist Alex Hellid who didn't want his former bandmates to use the ENTOMBED moniker.